It really depends on how prepared the client is with their project requirements and how quickly the client is able to return feedback and revisions. It also depends on how many individuals are on the decision committee. A quick turnaround for a custom logo is one week. Most collateral design projects can be completed in two weeks—assuming the client has all their copy and information pulled together and can respond with feedback and revisions the next day. Websites can take anywhere from two weeks to several months depending on the complexity of the website. Click here to learn about the Bonilla Design Creative Process. Once we receive final approval and final payment the final art becomes your property. We will email you the final art in whatever file types best fit your needs. We keep backup copies of everything (just in case). We reserve the right to use the comps and final art in our portfolio and for promotional purposes. Before we begin any project, we submit a job estimate to the client that includes the expected fees. The estimate is based on the amount of time we expect to spend on a project. A 50% deposit is required to begin the project. The remaining balance for logos and printed materials is due within 14 days of the client receiving the final invoice. The remaining balance on websites is due before the new website is made live on the internet. Additional revisions beyond those included in the estimate are charged at $75/hour. We also offer monthly website maintenance and updates for $75/hour. I need a website. What do I do first? The answer is simple (and it’s not design!) Content. Content is both the most important part of a site and paradoxically, the first step. We can help you fine-tune your strategy and determine which features will be most useful for you. You also need to reserve your domain name and purchase your hosting service. We can assist you in both of these steps as well. The website can be designed based on an existing template or designed completely from scratch. Both have advantages and disadvantages and depend largely on your budget and if you want to perform your own website edits on a monthly basis. Generally, we can have a semi-custom site going in a few weeks from start, depending on the complexity, where a custom site might take several months. Do you design and code websites? The answer is yes and no. We have found it to be most advantageous for us to do what we do best and to let programmers do what they do best. So we specialize in the front end of the website design process. We design the look and functionality of the website. We implement the parameters outlined in the creative brief and make sure the website is continuing the desired brand. Once the design as approved, we prepare files that are ready for programming. We have several talented programmers that we partner with. We can also hand over the design files to any programmer of your choice. Before we begin any project, we work with the client to compile a detailed creative brief. This ensures that the project stays on course and meets the expectations of our client. A 50% deposit is required to begin a project. If the client chooses to terminate the project before completion, they will only be charged for the design time spent up until the time of termination. I’ve worked with a designer in the past who seemed to disappear over night. What can I expect from Bonilla Design? When you hire Bonilla Design you get the senior level design team of Gabe and Nicole Bonilla. We work closely with you from start to finish. We also support you after the project is complete, so you can always call us with questions. Why should I hire Bonilla Design to design my logo when I can use an online source for much cheaper? When it comes to graphic design, you definitely get what you pay for. Online logo designers create batch logo designs. They are limited in the amount of information and research they use in designing their logos. 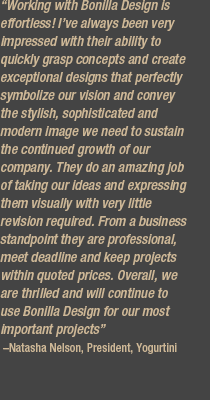 The graphic designers hired to work for these online companies do not have the senior level education, training and experience of Gabe and Nicole. Investing in a strategic, professional logo design from Bonilla Design is an investment in the future success of your product/company. What is the difference between pixels and vector art? Please refer to our blog Pixels vs. Vector Art: What’s the Difference? What is the difference between CMYK and RGB color?